Below you'll find featured departures from Globus Journeys. You can also click the Globus logo to shop all of their itineraries, and see current promotions, pricing, availability, and even book online through Viking Travel with the full support of our agents. "This vacation shows you all of Portugal at a relaxed pace, thanks to the well-planned, 2-night stopovers in Lisbon, Oporto, and the Algarve, and overnights also in Tomar, Viseu, and Evora. 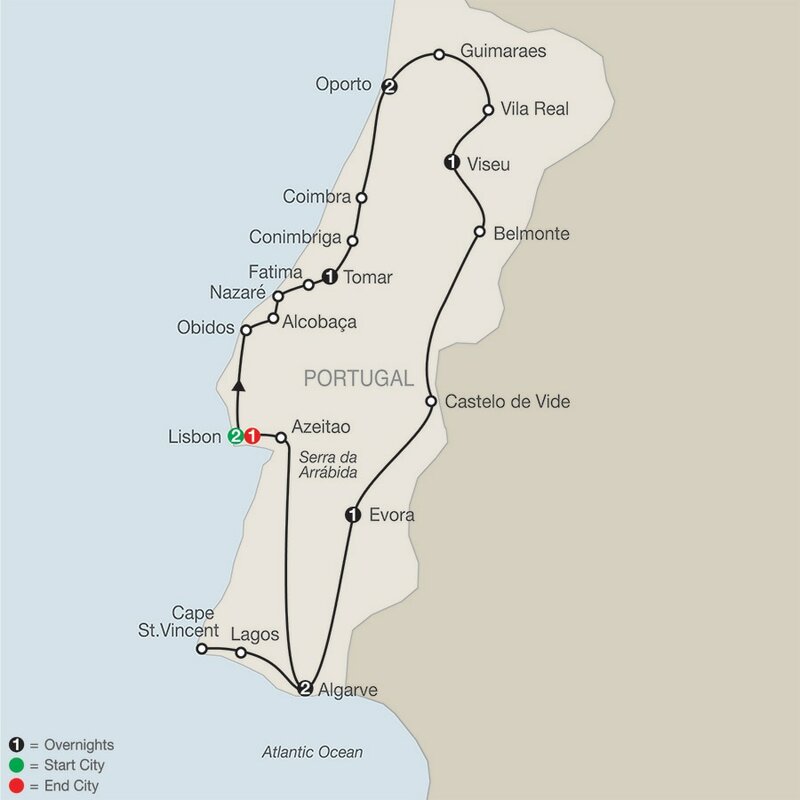 Start in Lisbon and see the interior and almost the entire coastline of Portugal. Throughout this Portugal tour, you’ll visit the must-see attractions, including the Ossuary Chapel in Evora, with its walls covered with thousands of human bones and skulls; the Sanctuary of our Lady of the Rosary in Fatima, a pilgrimage site where apparitions of the Virgin Mary were reported by three local children in 1917; the Church of Sao Francisco in Oporto, the city's most important gothic temple with construction beginning in the 14th century; and Jeronimos Monastery in Lisbon. Built in the 16th century and now regarded as Lisbon’s most important landmark, it was traditional for Portuguese seafarers to pray in the chapel before their departure to the unknown. Enjoy the Roman ruins of Conimbriga, tour the excavations, view the well-preserved mosaics, and visit the excellent museum. Spend time in the Algarve, Portugal’s most popular vacation area, and take an excursion to the Promontory of Sagres, where Henry the Navigator lived and planned his overseas expansion. For those interested in food and wine, Globus has arranged some special treats for you. Enjoy an olive oil tasting in Belmonte (birthplace of Pedro Alvares Cabral, discoverer of Brazil), a wine tasting at a Port wine cellar in Oporto, and more. All of this and much more await you on this wonderful, in-depth Portugal tour! "